Rohingya refugees in Bangladesh face serious risk during upcoming monsoon season, warns the UN Refugee Agency. Rohingya refugees who have fled to Bangladesh are already living in camps, along the Myanmar-Bangladesh border, that are in dire need of funding for medical treatment, sanitation, and other basic needs. 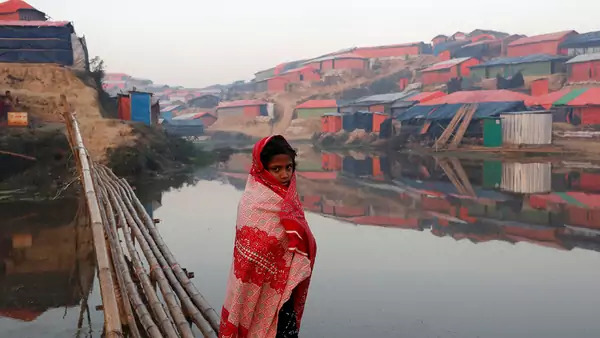 Currently, the best estimates suggest that the biggest settlement area inside Bangladesh—in Kutapalong and Balukhali—contains more than 560,000 refugees. It is the biggest refugee settlement in the world, according to UNHCR. Although the Bangladesh and Myanmar governments have discussed plans to repatriate Rohingya refugees back into Myanmar, and created a timeline for possible repatriation, few Rohingya are going to voluntarily return to Myanmar at this point. The situation in Rakhine State remains extremely tense and unsafe for Rohingya, and Rohingya have no protections if they return to Myanmar. The BBC has reported that “Myanmar's foreign secretary U Myint Thu told BBC Burmese that transit camps [for Rohingya] are under construction” inside Myanmar, but there is no guarantee these camps will provide any protections for Rohingya rights. Almost every day, it seems, more Rohingya flee into Bangladesh, and last week a lengthy Associated Press investigation revealed more evidence of mass graves in Rakhine State, adding weight to arguments of ethnic cleansing and genocide. The start of the planned repatriation process was delayed last month, and many rights groups and international governments have emphasized to Dhaka and Naypyidaw that any repatriation process must be voluntary. Meanwhile, the situation may soon get even worse for Rohingya refugees in the Bangladesh camps. Monsoon season will be coming soon in Bangladesh, and the Rohingya camps could face devastating weather. Last week, UNHCR warned that heavy rainfall, and possible cyclones, could decimate several of the crowded camps, putting vast numbers of people at risk. The organization’s initial risk analysis of the dangers from monsoon season reported that around one hundred thousand refugees could be at risk from landslides and flooding alone, while many of the health and other critical services in the camps could be washed away. The fact that the refugee inflow from Myanmar has destroyed much of the vegetation in the area in and around the camps only increases the possibility for flooding. In normal times, that vegetation would normally provide some degree of resistance to floodwaters. Several aid groups have reported data showing that about one-third of the land in the Rohingya refugee camps, which are, in parts, on unstable plots of earth, could be washed away in the monsoon season. UNHCR and other aid groups have provided a high-quality map of the potential destruction, and it is available here. Aid agencies have been taking preparations for monsoon season to hit the camps, but the camps are constructed on such unstable land, and so many of the shelters in the camps are in areas that are exposed to the weather, that it may be nearly impossible to move most of the refugees at highest risk, or to fortify the camps to prevent a disaster. Aid agencies provided a warning, last Friday, that the window of opportunity for fortifying the camps for monsoons and moving refugees’ shelters is closing rapidly.